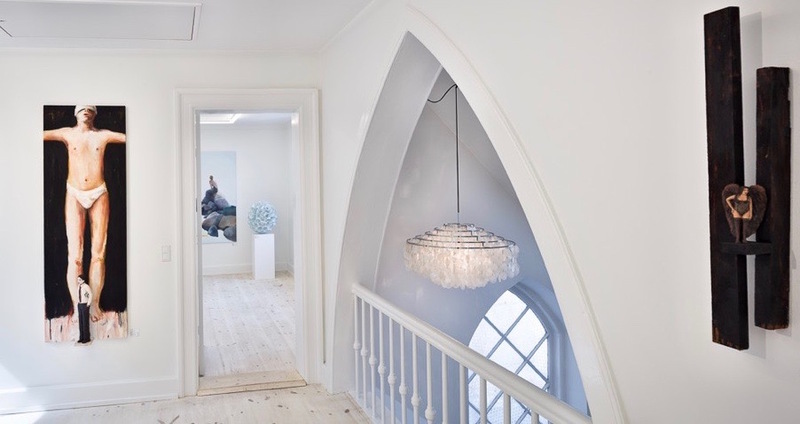 GALLERI V58 was founded in the spring 2007 by Eigil Johansen and Chris Sørensen. For the first six years of its existence it occupied roughly 200 m2 on Vestergade 58; an address that holds an important place in Aarhus’ cultural and musical history. 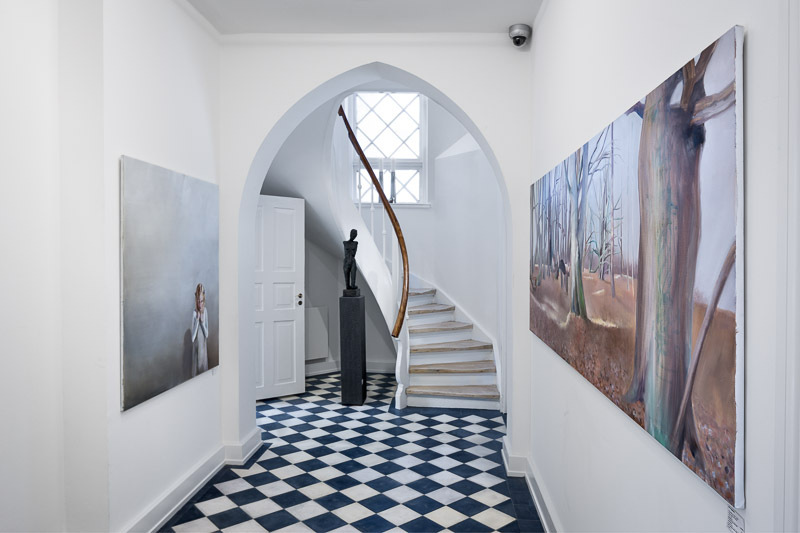 In April 2013 the gallery moved to a new address, Hans Hartvig Seedorffs Stræde, into an attractive historical building known as Børnely. However, even after the move, GALLERI V58 kept its established name referencing its previous address. Børnely lies in the very heart of Aarhus, close to both the City Hall and ARoS Aarhus Art Museum. The building offers approximately 400m2 of unique, elegant and light exhibition space, which is divided into two floors. The gallery currently represents around 35 highly competent, professional, and passionate artists from all around the world. Their works form a basis for our solo and group exhibitions presented throughout the year, and ensure gallery’s place among the most significant and interesting galleries in Denmark. 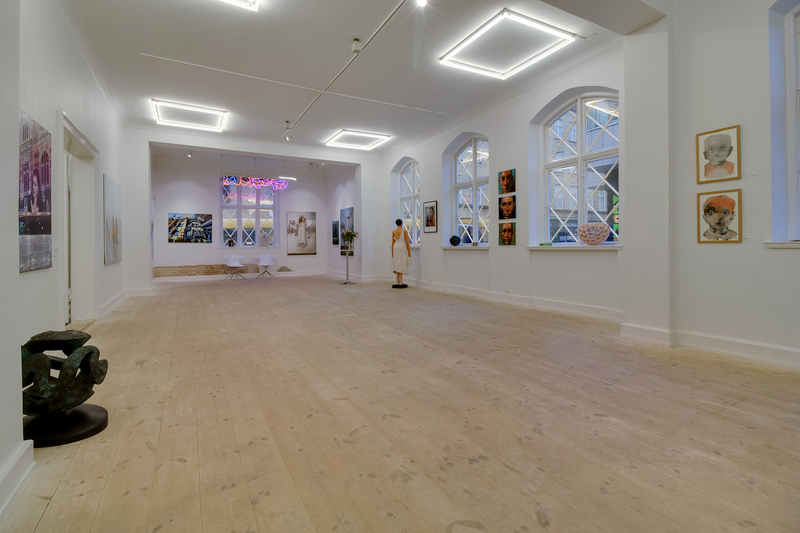 Over the years we also participated in various relevant art fairs, such as Art Herning or Art Copenhagen, and took part in interdisciplinary collaborations, for example with Aarhus Billedkunstcenter. We constantly explore new artistic interfaces and keep in touch with new trends in the art world. Artists represented by the gallery work with diverse art mediums and materials, allowing us to present a wide selection of appealing works, including paintings, drawings, photos, ceramic and bronze sculptures, installations, and many more. As a result, we can always find a satisfying solution to our customers’ needs. GALLERI V58 combines art, architecture and history into a fresh exciting whole, and we are truly proud to welcome you to a new way of experiencing art! Visitors of GALLERI V58 show a great interest in the building it resides in, which in addition to its aesthetic appearance offers a fascinating history. The building was built in 1883 and given the name “Børnely”. It was commissioned by St. Stefan Association in Aarhus; a sister association to the Danish “Diakonissestiftelse” at Frederiksberg in Copenhagen, and designed by the architect Carl Lange. Aarhus was experiencing a rather intense period of urbanization during the second half of the 1800s, and Carl Lange is the architect behind several significant buildings from that time, such as Ridehuset and Wormshus by St. Clemens Bridge. The urbanization was a result of rapid population growth and subsequent need for not only more but also bigger buildings. In 1840 there lived only app. 7.000 inhabitants in Aarhus, however, by 1900 the population grew to 50.000. One of the consequences of this enormous population growth was a rising number of poor people living in the town, which lead to many social issues. One of them was taking care of children while their parents were at work, and this is where Børnely played an important role. The building functioned as a nursery (nowadays a kindergarten), where deaconesses provided care for approximately 100 children. The building housed the kindergarten until 1954, when the institution moved to a new place on Valdemarsgade, where it resides till this day. After the kindergarten had moved out, the building fell under the administration of Aarhus Municipality. Its next occupant was a youth club, which previously resided on Mejlgade. The youth club and the building itself was now called Mejlen, referring to the club’s previous address. The youth club stayed in the building until the 1970s, and afterwards it was leased to Danish Red Cross. 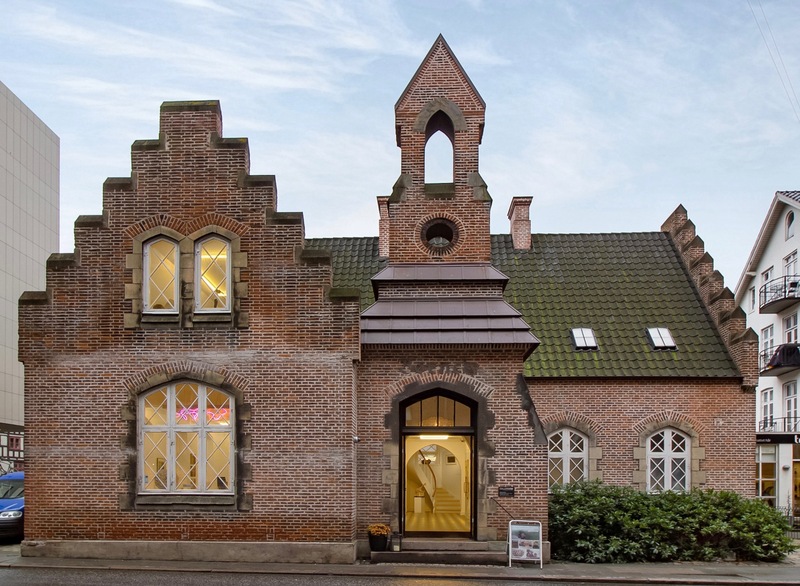 In 2009, Danish Agency for Culture decided to conserve the building on grounds of its historical and architectural value, and thus in April 2013, after the thorough renovation, GALLERI V58 moved in. Børnely is a free-standing structure and therefore, distinguished facades with beautiful gables are visible from three side. Regardless if one is approaching it from Busgaden, Park Allé or standing right in front of it, one always has an opportunity to admire its historical architectural expression and impressive Gothic features. 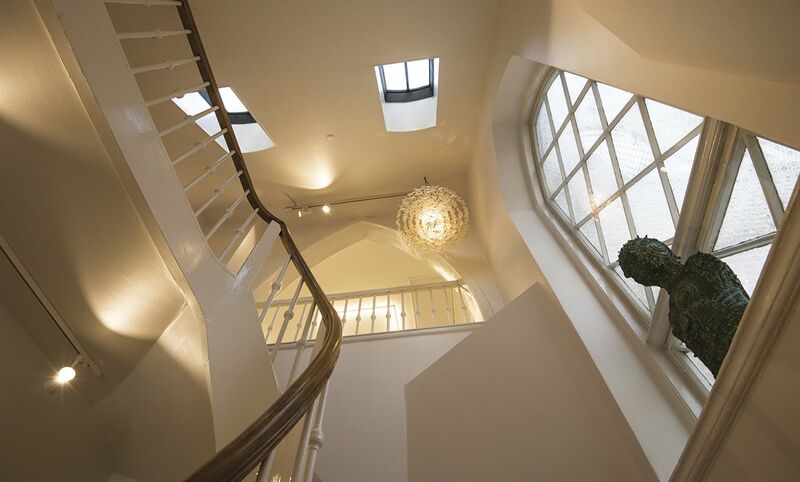 The architecture of the building reflects the period’s fascination with historicism; a style, which in an eclectic way mimics and imitates styles of previous periods, and whose popularity in Danish architecture culminated in the second half of the 19th century. 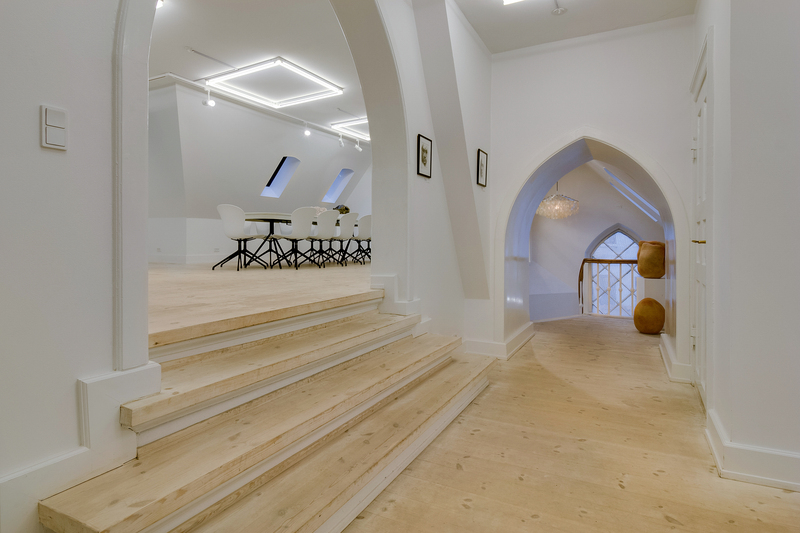 In this specific case, the building’s architecture references both Gothic style and Danish Renaissance. Gothic architecture is mostly associated with churches and cathedrals and is mainly characterized by pointed arches, which are incorporated into the windows of the building. Gothic architecture appeared in Denmark around the 1200s and became a preferred architectural style within a religious context. When it comes to Danish Renaissance, the main influence can be seen in the building’s resemblance to Danish manor houses, which were built all around the country in the period from the mid 1500s till mid 1600s. The manor houses were built from brick and stood out because of their stepped gables, which also adorn Børnely’s façade. It was important for the Danish “Diakonissestiftelse” who commissioned the building, that it expressed solidity and capability. The solid bricks referencing the persevering architecture of manor houses and towering church- or cathedral-like lines ensure that that was precisely the impression one would get. When it was constructed, Børnely was the only building whose façade faced the alley, and has therefore obviously projected an aura of competence, superiority and strength. Nowadays, Børnely with its two stories is no more the tallest building on the street, but its aura of history and cultural heritage still distinguishes it from other buildings on Hans Hartvig Seedorffs Stræde. Aarhus is among other things known for its well-preserved historical buildings, and with Børnely being one of the city’s gems, it is certainly worth a visit.